« Space Exploration Not an Exact Science! Large earthquakes and volcanic explosions could split Arabian Plate, North American Plate, Pacific Plate [in multiple places] and shatter Filipino Plate. Erta Ale, an active shield volcano located in the Afar Region [northeastern] of Ethiopia in the Danakil Desert, is Ethiopia’s only active volcano.License: cc-by-sa-2.0. Credit: posted to Flickr by filippo_jean. Erta Ale is part of the so-called Afar Triangle, a highly active volcanic region which includes Dabbahu Volcano, located in the remote Afar Region of Ethiopia. Dabbahu eruption in 2005 created a large fissure in the ground, called the Dabbahu fissure. The volcano is the hottest place on Earth’s surface. Leading to Dabbahu’s only known eruption in recorded history, which formed a 500 meter long fissure and a 30 meter wide pumice cone at the fissure’s southern end, on September 26, 2005 the ground swelled as a cluster of more than 130 tremors shook the area near the volcano. Dabbahu Fissure, along the Somalian Plate, Great Rift Valley (Boina/Afar, Danakil desert, Ethiopia). A ground rupture created during the September 2005 rifting event. Photo: Tony Philpotts/ AP. Image may be subject to copyright. 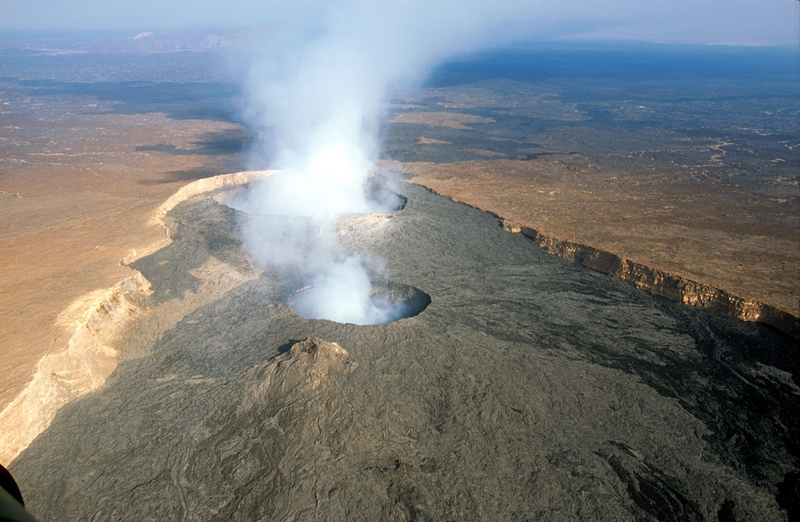 Researchers say volcanic activity could split the African continent in two, a claim supported by a recent ground rupture that appeared in northeastern Ethiopia. The 60-kilometre (35-mile) split in the desolate Afar region, which was the result of two volcanic eruptions in September 2005 [Dabbahu Episode, Afar,] has enabled scientists to further examine the earth’s tectonic movements, said a report published in the Geophysical Research Letters. “The significance of the finding is that a huge magnetic deformation can happen within a few days like in oceans,” Atalay Arefe, an Ethiopia-based university professor who was part of the study, told AFP in an interview. Faults and fissures that normally occur on the ocean floor largely contribute to the continents breaking off and moving away [spreading] from each other, in the same way African continent broke away from South American plate 100 million years ago. “Normally, such phenomena happens beneath the ocean, which is inaccessible, expensive and very difficult to make experiments. But in Afar, it’s quite a natural laboratory for us to carry those out,” Atalay said. “The ocean’s formation is happening slowly, likely to take a few million years. It will stretch from the Afar depression (straddling Ethiopia, Eritrea and Djibouti) down to Mozambique,” he said. At 120 meter below sea level, Ethiopia’s Afar Depression is one of the lowest and hottest places on Earth, famous for its salt mines. This entry was posted on November 4, 2009 at 3:03 am	and is filed under Arabian Plate, filipino plate, Gulf of aden rift, large earthquakes, Nubian Plate, red sea drift, Somalian plate, Volcanic Explosions. Tagged: Afar Depression, Boina, Dabbahu fissure, Dabbahu rift, Dabbahu Volcano, Erta Ale, Great Rift Valley. You can follow any responses to this entry through the RSS 2.0 feed. You can leave a response, or trackback from your own site. Huge crack has opened in Kenya’s Rift Valley. The crack stretches several kms and is growing. Part of a highway has collapsed and several families have been evacuated from the Suswa area in the south-western part of the country.